MotoGP 14 has been built from scratch and using a graphic and physics engine completely redesigned to give the best of itself not only in PlayStation 4 , but also on the previous generation platforms . A new sound effect , new light effects in real time, stunning graphics and details never before seen on a motorcycle game and a multiplayer mode that will offer an enhanced experience , and much more rewarding than in previous installments . 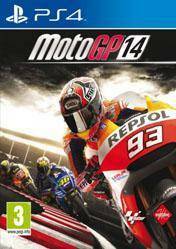 MotoGP 14 includes the tracks and riders from the 2014 MotoGP season , the pilots of the 2013 MotoGP class and past champions . In total, more than 100 pilots , officers all manufacturers and 18 circuits. Moreover, in this installment , the pilots enjoy a level of unprecedented realism , as they react to the movements of the bike with ultra-realistic animations. In addition, all persons who appear in the game ( mechanics , spectators, etc ... ) react to the actions of the pilot showing his feelings with gestures visible . There are no comments yet about MotoGP 14. You can be the first one!